Thanks for asking me to write a piece for your blog, Matt! 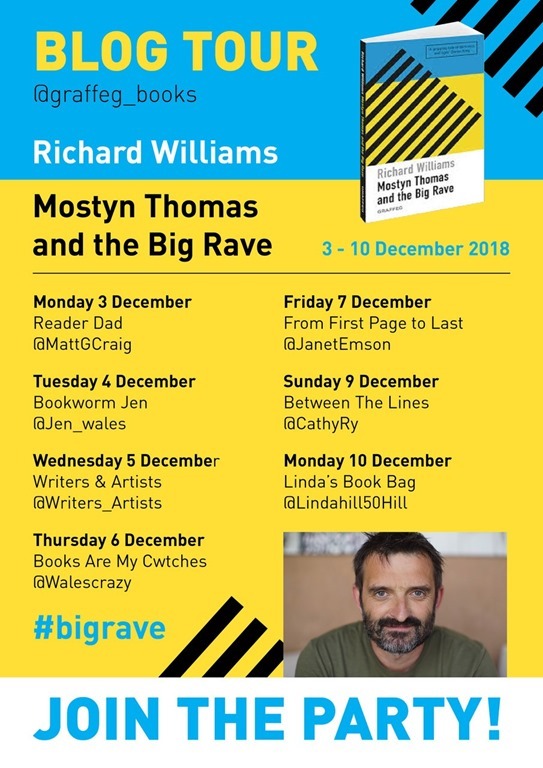 The idea of Mostyn Thomas and the Big Rave grew from the realisation, many years later, of a colourful and unique time in rural Welsh history that went largely undocumented – the early 1990s. Family farming began a rapid decline due to the opening up of the EU common market, which allowed cheaper products to enter UK markets, tariff free. This had a huge impact on small-scale family farming (including my own). And then BSE arrived. Church and chapel congregations also declined rapidly, impacting profoundly on community and tradition, which were always intrinsically linked to religion in rural Wales. Margaret Thatcher was banging on that there was “no such thing as society,” and that individual and selfish pursuit of ones objectives was the way forward. All of this led to a glum outlook for the future of community life in rural West Wales in the early 1990s. But then, Boom! 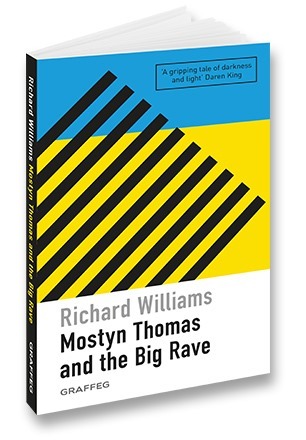 A remarkable paradox took place – rave culture arrived in the clubs of Cardiff and Swansea, and soon after in Tenby in South Pembrokeshire. Within twelve months, the youth of literally all four corners of the county became mobilised like a tribe, every weekend, in a popular culture youth movement that was broad, inclusive and hedonistic. It smashed down class barriers and infected a young generation with an egalitarian and community-focused mindset that sought simply peace and good times. Raves were held on farms, secluded beaches, warehouses, old bakeries, people’s houses, hippy communes; to name a few. They were magical times of community and love, especially with Pembrokeshire and our beautiful coast and countryside as the backdrop. Pembrokeshire had an eclectic mix of sub-cultures at that time: surfers, ravers, sailors, rugby players, horse-riders and more, coupled with all of the country tradesmen – brickies, sparkies, chippies – all full of energy in this forgotten outpost, and all looking for trouble of a weekend, wherever it could be found. The characters in the novel are hybrids of all the farmers, charmers, waifs, strays, chancers and gangsters of rural Pembs at that time. None are based on a single person. Every character is probably made up of four or five people, a kind of ‘best of’ characters of north Pembrokeshire. For example, Mostyn has elements of my Dad, uncles (all farmers) and local farm workers. But Mostyn is a bachelor, unlike all the characters that may have inspired his character. Rave culture is well documented in urban areas of the UK, but I felt what we got away with in the wilds of the countryside was remarkable. For probably a three-year period (1991-1993), the police had no laws to stop raves, no laws or deterrents to stop kids driving under the influence of recreational drugs. They couldn’t even find the locations of the raves – they were kept so secret. The rave “Lewistock” – the rave in the novel, is based on a real event, which took place on my father’s farm in May 1994. Organised by the Party Tribe (a local soundsystem of DJs led by DJ Eddie Taurus – the vicar of Camrose’s son). We put flyers around the clubs in Tenby and expected around one hundred ravers, but over eight hundred turned. Something unique happened that night, and I really wanted to somehow document the whole adventure of our time creating Lewistock. In terms of influences – Steinbeck’s Grapes of Wrath had a profound effect on me, being a farmer’s son. Steinbeck’s ability to convey man’s beautiful and brutal relationship with his land made me want to attempt to write in a similar way about the life of a Pembrokeshire farmer. Crime and Punishment was also a big influence in developing the troubled character of Biscuits – conveying the descent into the abyss of human nature and how close we all could be to this abyss if pushed too far. I hope the book reminds or informs the reader of the virtues and joys of living in a close knit rural community of disparate characters. I also hope the book highlights that the peripheral characters in a community are often the ones that hold it all together and make the greatest sacrifices to sustain it. It would, of course, be rude not to include a Star Wars reference in this blog article! So I’ll be honest about how it came about. During my brief period experimenting with hallucinogens (twenty-five years ago now!) I used to always see Star Wars characters popping up out of nowhere, especially on the heads of nightclub bouncers, who would, without fail, morph into the heads of Gamorrean Guards (those gruesome servants to the crime lord Jabba the Hutt). Don’t ask me why, they used to terrify me! This is why these unsavoury characters make the odd cameo appearance in the novel. I hope you enjoy it!